After working for the Cache County Commission (a local Co-Op that was closing its doors) for many years, Nettie Anderson decided to strike out on her own and start her own business. She took with her a knowledge of the seed and feed business, some old scales, and a bunch of old wooden drawers to house her product, namely seeds. Logan Seed and Feed opened in December of 1942, in 500 square feet of an old abandoned storefront that used to be the home of the Sydney Stevens Implement Company. Nettie was finally on her own, running a business, and doing it in a male dominated environment. She truly was a pioneer for women in business. Nettie started with a selection of seed that farmers needed and all the feed products that most home owners needed as well, as in those days, almost everyone had their own livestock. Over the years, as her business grew and her product selection diversified, the space around her had to grow as well. She rented more and more of the old storefront from the Sydney Stevens family until finally she negotiated a purchase price and bought the whole property in the early 1950’s. She continued to add property through those early years, even though they (eventually her husband sold his dairy and came to work for Nettie) could barely afford to keep things running. Nettie had a vision of what her business and property could eventually do, and she saved every penny and worked hard to keep adding the necessary pieces to allow her business to grow. Over time, she expanded her business to even include a Garrett Freight Lines commercial shipping division to supplement the retail location. Nettie worked right up until the day she passed away (in 1976), leaving the business in the capable hands of her two children, Clyde and Bud. Clyde supervised the retail part of the business and Bud supervised the freight delivery. Over the years, the Seed & Feed had changed names (Anderson’s Seed & Feed), expanded into more garden business, and had diversified to the extent that pet supplies and holiday décor was as much a part of the business as the seed and feed. In 1989, Clyde purchased Bud’s share of the business and successfully ran the store until he sold it to his son Mark and his wife Ronnette in 1999. 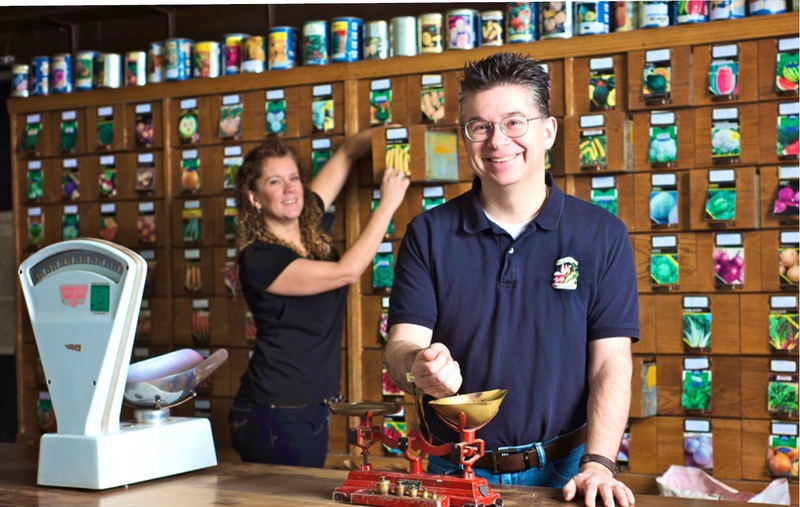 In the fifteen years since Ronnette and Mark Anderson have taken the reins of Anderson’s Seed and Garden, Inc. many changes have occurred. Retail space has quadrupled, warehouse space has more than doubled, outdoor nursery stock space has doubled, parking has increased 50%, and that only encompasses the physical makeover of the business. They have expanded garden center business into a lawn maintenance company that services 500 lawns each month for 8 months of the year and employs 4 people full time during those months. More than anything else, Anderson’s has become the source for gardening information, the best products, and reliable service to the community. Anderson’s Seed & Garden’s presence anchors downtown Logan, brings gardeners into the valley from surrounding areas and states, and continues to provide the information and resources that Cache Valley gardeners need to be successful. We truly live by our Mantra: Growing Better Gardeners. Mark has a bachelors and a Masters degree from Utah State University. Locally he also serves on the Logan City Forestry Board and is a member of the Logan Downtown Alliance and the Cache County Chamber of Commerce. Mark lives with his wife, Ronnette, and their 4 children in Logan where they are co-owners of both Anderson’s Seed and Garden and Logan Extermination.